Joel Pelzner talks to Bethany Zaro, New Canaan's public health nurse, via Skype on Feb. 12, 2014. Pelzner is one of 63 seniors participating of this year's Tele-Health program pilot. After returning from his daily walk, 68-year-old Joel Pelzner checks his Fitbit device to see how many miles and steps he walked and how many calories he burned. He also weighs himself and checks vital signs with a blood pressure cuff and a pulse oximeter. Pelzer then records those stats in an Excel spreadsheet, which he'll discuss with a nurse on Skype. "How do they look?" Pelzner asked Bethany Zaro, the town's public health nurse, during a Skype session Wednesday. "They look great," Zaro said. "You're my poster child." Pelzner is one of 60 seniors with whom Zaro interacts on a weekly or biweekly basis as part of the New Canaan Tele-Health Program. The project aims to keep seniors in good health by having them regularly check their vital signs, such as blood pressure and heart rate, and communicate electronically with a nurse. Following last year's widely acclaimed success of the pilot program, which ran between January and June, it was expanded for the same time period. The first go-around had 15 people and all equipment was provided by the program. This time, there are 60 participants who are using their own iPads, iPhones, laptops or desktop computers equipped with a camera. Pelzner, a former president at the Senior Men's Club of New Canaan, said the program has made him more aware of his wellness. "It allows you to focus on your vital statistics every day," Pelzner said. "What I really enjoy is that it gets you to focus and move." In the pilot program, the participants ranged in age from 70 to 85. This time around, the age range is between 60 and 93, according to Jim Lisher, chairman of the New Canaan Health and Human Services Commission. Lisher said the results of the first pilot were "outstanding" with all 15 participants maintaining or improving their health and wellness. Those involved with the program hope it will keep seniors in better health by focusing on wellness, and save the health system money by treating patients with preventive care. 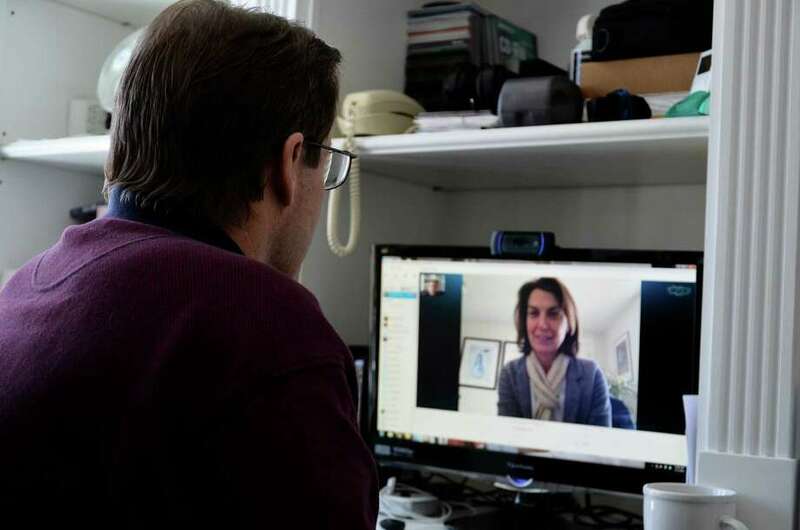 Typically, every week or two, participants connect with Zaro on Skype or FaceTime to talk about their readings. If readings change, Zaro recommends they see their doctor. The participants also review a list of questions, such as how they have been feeling and how they have been sleeping. Another difference from last year's participants was that they were "extremely healthy," Lisher said. "We were testing the technology," he said. "That was our single goal." Lisher said all participants "loved it." Blood pressure and weight, two very critical issues among the senior population, went down for most participants in 2013. Eleven of the 15 seniors lost weight, Lisher said, even though weight loss was not a focus of the program. "Because you weigh yourself every week you become more aware of your weight," he said. "You see how much you're moving around every day so you can't help but lose weight." Blood pressure went down for eight out of the 15 seniors last year, according to Lisher. Though all participants are New Canaan residents, some of them are out of town, but most of them still took their devices. Zaro said there are some participants in Florida and a couple in Hawaii, for example. In 2013, the program provided seniors with tablets. This time, they're using their own devices, but the program provided the monitors. Organizers believe this is the only program of its kind in the nation. Lisher said many institutions around the country are looking at the program. He said he's been asked to make presentations about it across the state, including in Hartford and New Haven. He also said he was contacted by Johns Hopkins University in Maryland and organizations in Indiana, California and Florida. The project is funded through a private and public partnership. Last year, the nurse was Susan Klehm, but she recently accepted a job at Waveny Care Center, Lisher said. Zaro, who has working part-time for the program, said each session lasts about eight minutes. Even though the second pilot officially started just a few weeks ago, Zaro said participants already are noticing trends. "They're becoming very much involved in their wellness," she said. Zaro said she's also noticed a psychosocial effect on participants. "Not only do they Skype with me, but they're doing that with their families," Zaro said. "It's phenomenal. I feel like I just made 63 new friends." One of the program's goals is to make New Canaan "a great place to grow up and grow old." "Baby boomers are turning 65 and there has to be a way to accommodate their needs," Zaro said, "because their needs are going to be greater."